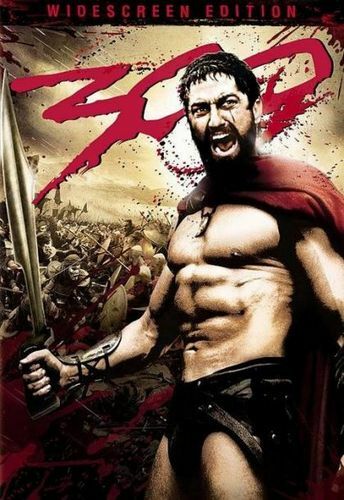 300 is a film about the Battle of Thermopylae in 480 BC between Spartans and Persians. Spartan king Leonidas (Gerard Butler) gathers 300 soldiers to fight the Persians. They build a wall at the narrow cliffs of Thermopylae (Hot Gates). Even though the Persian army is one million solders strong, the Spartans fight off numerous waves of attackers, incurring heavy losses of life on the Persians. Back in Sparta, Leonidas' wife, Queen Gorgo, (Lena Headey) tries to persuade an influential politician, Theron (Dominic West), to help her rally support for her husband. Theron demands that she sleeps with him, but then goes back on his promise of support. Outraged, the Queen kills him. Since Theron is unmasked as a Persian traitor, the Spartan Council unites against Persia. At Thermopylae, a deformed Spartan outcast, Ephialtes (Andrew Tiernan) betrays his countrymen and shows the Persians a goat path. The Spartans refuse to retreat with the Arcadians. Leonidas only orders Dilos (David Wenham) to leave the battleground in order to tell their story. The sacrifice of the Spartans inspires all of Greece to unite against the Persians. They rally a big army and prepare to fight off the invaders.